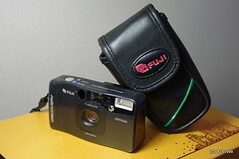 Released in 1990, the DL-500 is the dual-lensed compact camera from Fuji, offering 28mm and 45mm focal lengths. Has date and a panorama mode. 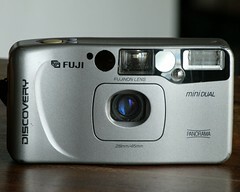 The Japanese edition was known as the Cardia Travel Mini Dual-P (with date and pan), while the American release is called Discovery mini Dual Date (no pan). 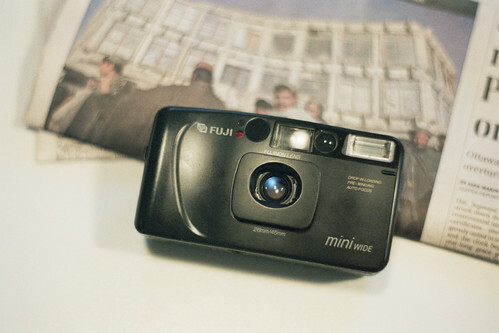 Early models are distinguished by the auto-retracting lens barrier, whilst later copies starting in 1991 have an integrated UV filter as lens protection. These models are called DL-500 Wide Panorama Date, DL-500 Wide Date and Discovery mini Dual. Silver versions are also available of the Cardia Travel Mini Dual-P and Discovery mini Dual. A variation, the Discovery Mini-Dual Plus, and Discovery Mini-Dual Panorama Plus has an extra light for red-eye reduction. Wide angle: 28 mm f/3,5, 3 elements, 3 groups. Normal: 45 mm f/5,6, 5 lenses, 5 groups. Active autofocus with pre-focus, closest range 0,45 m.
Auto-exposure from EV 9,25 (45 mm: EV 10,9) to EV 16,9 (45 mm: EV 18). Backlight compensation mode, "landscape" mode (infinity focus). Built-in flash, range 0,45—3 m (28 mm, ISO 100). DX decoding from 50 to 1600 ISO in full stops; non-DX film is exposed at 100 ISO. 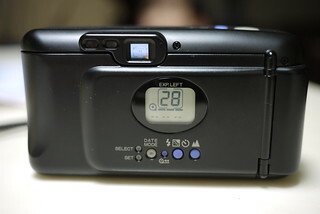 Drop-in loading; the film is wound into the cartridge to protect exposed frames if the back is opened. Power: 3V CR-123A lithium battery for motor and focus, CR2025 battery for other functions. The camera won't work without both. Dimensions and weight: 121x65x41 mm, 210 g.
This page was last edited on 3 November 2016, at 06:24.